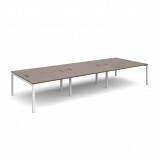 We offer a range of low-cost bench desks that are suitable for most office applications. They provide a simple solution to fitting your workforce into a compact footprint. We offer them in fashionable white MFC. We offer them in two, four and six person configurations. 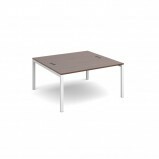 Options are also available to add cable management, screens and desk under pedestals. Contact Us for more information on our range of Cheap Office Bench Desks. Back to Back Bench Desking As bench solutions are becoming more popular and mainstream in open plan offices, the Connex range has been developed in response to modern office design and is a cost effective benching solution. 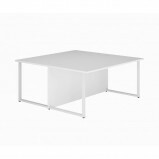 Through its t..
Back to Back Bench Desk This stylish White Rectangular Back to Back Office Desk. it comes with a White MFC table top finish with white bench style frame including a modesty panel FeaturesCable PortsAdjustable Feet25mm Board Optio..
Back to Back Bench Desk with Screen This stylish White Rectangular Back to Back Office Desk. it comes with a White MFC table top finish with white bench style frame including a modesty panel complete with a divider screen in seven vibran.. Bench Desk Standalone This stylish White Rectangular Office Desk. it comes with a White MFC table top finish with white bench style frame including a modesty panel FeaturesCable PortsAdjustable Feet25mm Board Options 1200 or 16..
Duo Coloured Straight Desk With Single Pedestal This stylish bench desk with an integrated single pedestal drawer comes with a high gloss white table top and a choice of stylish matt drawer front finishes FeaturesCable PortsAdjustable..